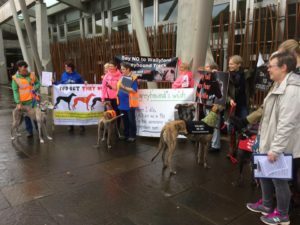 We had a good morning outside Parliament on 21st, standing up against the proposals to build a new greyhound race track. Well done to the organisers. It’s still not too late to sign the petition here. It’s also disastrous for the environment, with leather tanneries releasing toxic chemicals into our atmosphere and causing life threatening illnesses to the poor worker who must earn a living there. No one should be impressed by ‘real leather’ labels. Please ditch leather, there are so many wonderful alternatives available, made from eco friendly and durable materials. 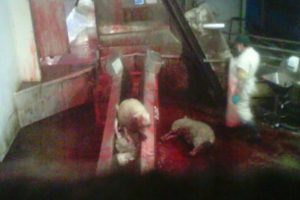 The UK Government yesterday announced plans to implement mandatory CCTV in England’s abattoirs. We commend our friends in the South who’s hard work and personal risk has led to this being placed on the table. 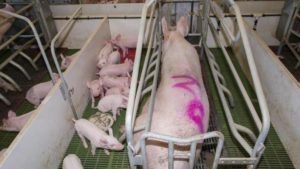 While we welcome the move we’re concerned by proposals that any footage may not be independently monitored but, instead, accessed only by slaughterhouse vets and Food Standards Agency inspectors. This falls short of our position of support for independent scrutiny to ensure proper safeguards. Indications are that these authorities are often unable to properly enforce welfare legislation in abattoirs effectively. If legislation is enacted any monitoring must be multi-layered, slaughter can’t continue to be kept ‘in house’. 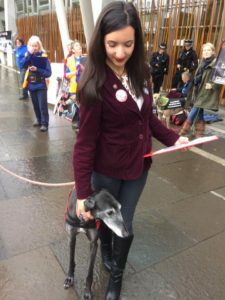 While wheels are turning in England the Scottish Government and Civil Service has opposed, and continues to oppose, calls from Scotland for Animals and the Scottish public to bring about the implementation of mandatory, independently monitored CCTV. We hope that Scotland’s politicians will now somehow find the bottle to act. Visit our webpage to support SfA’s campaign.